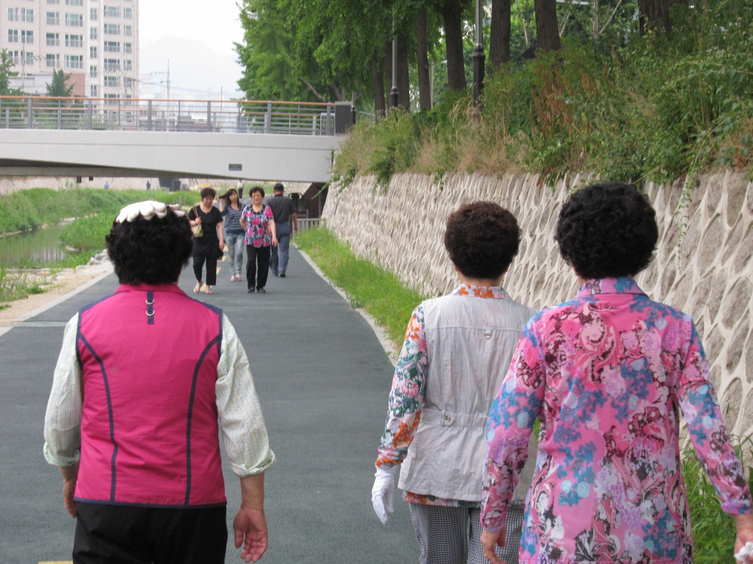 Ajumma: noun, \’a joom ma\ A middle-aged Korean woman, typically identifiable by a mop of short, tightly curled hair; baggy, mismatched clothing; and a no-nonsense, out-of-my-way attitude. Mismatched prints from the fall/winter 2014 runways of, from left, Acne, Duro Olowu and Viktor & Rolf. The mismatched prints worn by the hostess at Pot, left, and the wait staff, right, are styled after a typical ajumma, says restaurateur Roy Choi. Sun umbrellas among the young are already a thing in China. Visor chic at Marni’s spring 2014 show. Oversized visors are already catching on in Asia. V. Stiviano and the infamous visor.